Obituary for MR. CERO MELVIN, JR. | Matthews Funeral Service, Inc.
CHARLOTTE - Mr. Cero Melvin, Jr. “C”, went to be with God on August 5, 2018. 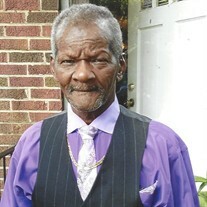 Cero, often referred to as C, was born in Wallace, NC on October 7, 1940. He attended Duplin County Public Schools. He was united in holy matrimony to Mary Elizabeth Williams on July 26, 1964. They had just celebrated 54 years together as husband and wife. This union was blessed with two children, Terean Beatrice Melvin and Sandra Bernadette Melvin, both of Charlotte, NC. Cero moved to Charlotte at the age of 23 where he began his career as a sanitation worker for the city of Charlotte. He also worked for C&T Refinery and later retired from Stamp Source as a machinist. Cero was actively involved in the church where he, along with his brothers and sister formed the family’s gospel music group, The Melvins. Cero is preceded in death by his mother and father; Ruby and Cero Melvin, Sr.; brothers, Henry Earl Melvin and Jimmy Melvin; and sister, Margaret Williams. Cero is survived by his wife Mary , their two daughters, Sandra Lorick and Terean Melvin; sisters, Mamie Jones of Charlotte, NC, Bessie Newkirk of Wallace, NC, and Francis Melvin-DeBose (Willie) of Raleigh, NC; brothers, Edward Melvin (Eunice) of Goldsboro, NC, Joe Melvin, John Melvin, and Larry Melvin all of Charlotte, NC; two granddaughters, Dimitri Lorick and Brittany Melvin both of Charlotte, NC; six great grandchildren, Zavion Melvin, Tristian Bradley, Kinsley Sims, Jayda Lorick, Jackson Lorick, and Mackenzie Lorick all of Charlotte, NC; aunt, Radie Sutton of Wallace, NC; five sisters-in-law and three brothers-in-law; along with a host of other nieces, nephews, relatives, and friends. Our family would like to express our deepest appreciation for the many acts of kindness and sympathy shown to us during our time of bereavement. A very special and heartfelt To all our friends and family, we love you all.